EDIT: Giveaway is officially closed. Congratulations to the randomly chosen 43rd commenter, Kathy Detweiler! 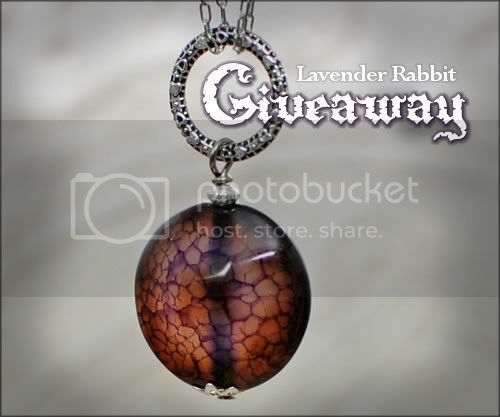 Donna of Lavender Rabbit is offering one lucky damsel the opportunity to take this dragon vein agate necklace captive. Dark purple veins run deep through the gorgeous brown agate bead. The unique stone clutches onto an antiqued silver-plated steel circle, wrapped by a gunmetal chain that closes with a lobster claw clasp. The Lavender Rabbit shop is hopping with herds of handmade jewelry, from earrings featuring flowers and cute creatures to wraparound beaded cuff bracelets. Donna crafts her designs in her den where her adorable bunnies nose-bonk her ankles. At first, she just made jewelry for herself - but when they ran out of room, her husband started selling it at his work. Now that the demand is so high, her husband helps and works on his own jewelry creations, too. Giveaway is open worldwide to entrants at least 18 years old. 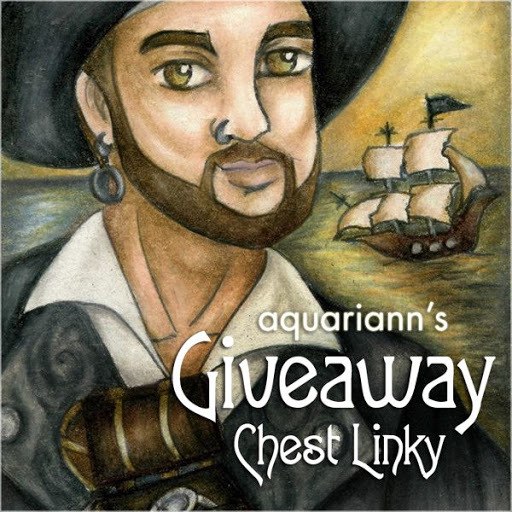 I will be pulling a number from my random.org top hat after 11:59pm EST on November 15, 2011, and the corresponding commenter will win! Donna will contact that lucky soul for a mailing address. If she doesn't hear back from the winner within 3 days, a new number will be drawn. Mandatory Entry: Hop around the Lavender Rabbit Etsy shop then comment on this post with your favorite handmade item and a way to contact you, preferably an email or Etsy shop. 1. Like that same item by using the facebook like button on the right sidebar of Donna's Etsy listing and leave a comment here with the number of likes to the right of the button OR share it on your business page and include the link when commenting. 5. Like Lavender Rabbit AND aquariann Art pages on facebook for one extra entry. 6. Follow Donna's Lavender Rabbit Hoppenings blog AND my blog on Google Friend Connect, Networked Blogs or your favorite RSS reader for one extra entry. 7. Tweet ONCE about the giveaway using the one below or a variation of your own. Leave a comment with the link. 8. Vote for my blog just by clicking Picket Fence Blogs. You may do this once a day. 9. Spread the word! Give this post a + 1 on Google or pin it to Pinterest. Click to share this giveaway on Stumble Upon, Technorati, Digg, or Del.icio.us. I'll honor one entry for every networking website you share it on, just make sure to leave separate comments for each. I adore the Yellow Burst Pendant Necklace! Voted on Picket Fence Blogs for you! So many of your items are incredible. Either the Yellow Burst Pendant Necklace or the Tiptoe Thru the Tulips Bronze Flower Earrings are my favorite. Tea Rose Flower Necklace Set is my pick. I love those flower beads and this one is a lovely colour. I liked the nestlings bunnies, just one like which is me so far! following both of you on GFC! I like the Amethyst Amulet Pendant Necklace. I liked Amethyst Amulet Pendant Necklace on Facebook. I'm the first one to like this item. I liked this giveaway on Facebook. I gave this post a + 1 on Google. I love Indigo Night Cateye Wraparound Bracelet Cuff! I'm a GFC follower of Lavender Rabbit Hoppenings and your blog. i love the "They Were All Yellow Pendant Necklace"
I love the Black Cherry Wraparound Bracelet Cuff! I liked my favorite, there is 1 like in the box now. I like Black Cherry Wraparound Bracelet Cuff) The colors are amazing! I like the Blue Lapis Bracelet Denim Delight. The Bee Lilac Lovelies Lucite Flower Earrings are gorgeous! I love the Agate NEckalce sooooo much!! But I also like the On the wings of a red hot love necklace and Eye of the Emerald Dragon Green Tigereye Necklace Set!! OMG your stuff is sooo nice!! My fav is the Grace the White Rabbit Necklace!! My favorite item is the Dark Star Nebula Purple Agate Necklace. Like the item on facebook like and there was 1 like. Added this item to my favs and hearted her shop as goldiez. Like this post on facebook as Diana Z. Follow you both on networked blogs. I Like this giveaway on facebook by using the like button at the bottom of this post and I shared on my FB site. I love the moth necklace! The Flying Hot Air Balloon Necklace caught my eye at the Etsy shop! My fave is Flying Hot Air Balloon Necklace! I like the Denizens of the Deep Seahorse Starfish Earrings. The Snugglebuns Duo Drop Rabbit Necklace is too cute! I like this giveaway on FB! 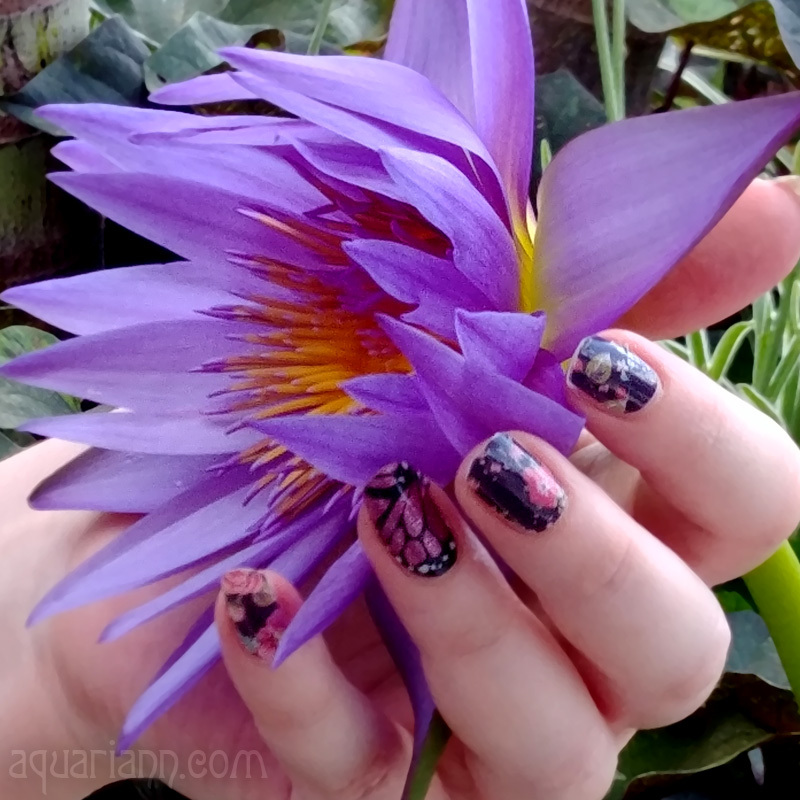 I like Lavender Rabbit and aquariann on FB! Following you and Lavender Rabbit on GFC! My favorite is the Summertime Blues Necklace Set. I really like Grace the White Rabbit necklace! I like the bronze bird beau necklace. I love the The Nestlings Bunny Bone and Silver Necklace! Love the Rose Pendant Necklace- Rose is a Rose. I adore the "They Were All Yellow Pendant Necklace." Simple and pretty! I like the Dark Star Nebula Purple Agate Necklace best! After liking the item in the shop, it now has 2 likes. I hearted the item, and hearted the shop also. I clicked the FB Like button on this post.